Below is code that produces a quoted string from a column in a dataset. This can be used in an IN-statement in SQL. Below is a description of very useful options in SAS, if you want a look “behind the scenes” and see what SAS actually does when processing data. fullstimer The SAS System provides the FULLSTIMER option to collect performance statistics on each SAS step, and for the job as a whole and place them in the SAS log. It is important to note that the FULLSTIMER measures only give you a snapshot view of performance at the step and job level. sastrace=(,,,d) Generates trace information from a DBMS engine. For engines that do not generate SQL statements, API calls and all parameters are sent to the log. sastraceloc=saslog Prints SASTRACE information to a specified location. In this case the log in SAS. mprint Specifies whether SAS statements generated by macro execution are traced for debugging. source2 Specifies whether SAS writes secondary source statements from included files to the SAS log. SOURCE2 specifies to write to the SAS log secondary source statements from files that have been included by %INCLUDE statements. nostsuffix The NOSTSUFFIX system option suppresses printing or display of trailing SASTRACE information and makes the SASTRACE log easier to read. It’s possible to insert the command below under keys in the Display Manager (DM) in SAS. The command will reset the line number in the log, clear the log and jump back to the editor. The SAS SQL-statement below will create a dataset containing all information for the observation with the lowest age in the dataset SASHELP.CLASS. The syntax for the SAS SQL-statement is showed below. As you see the <FUNCTION> doesn’t have to be min (minimum), it can be any function working on the type of <COLUMN TO SEARCH> – numeric or char. In SAS Enterprise Guide it is not very easy to see the size and number of observations in datasets in the WORK-library. The macro below looks in the DICTIONARY.TABLES and gets these info for the WORK-library. Be aware that it will not work for views, because it’s not doing and actual count of the SAS-datasets. Description : Gets info about datasets in the WORK-library. WORKDS : Contains information about the datasets in the WORK-library. Below is shown how you can extract the current Microsoft Team Foundation Server (TFS) revision number for a given file into SAS and use it in your SAS program. Be aware that Visual Studio 13 is used in the example below. It is uncertain if newer versions of Visual Studio will work. You can now use the three diffent macrovariables called tfsver1, tfsver2 and tfsver3 in your program. Microsoft Visual Studio Team Foundation Server 2013 Power Tools might be needed. You might also want to have a look at this blogpost regarding SVN. In SAS Enterprise Guide and SAS-DI you have the possibility to analyze the code for a SAS-program. 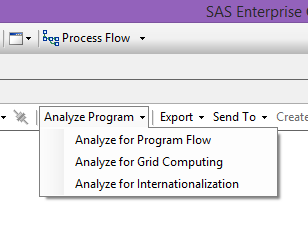 The picture below shows the Analyze Program option in SAS Enterprise Guide. Analyzing the code should result in a conversion of the SAS-code to a SAS Enterprise Guide flow or SAS-DI flow. But none of these code analyzers are very good. Depending on the complexity of the SAS-code you put into the analyzer, they will leave you with a more or less successful conversion. And more times than not they will fail at doing the job. But SAS comes with a procedure PROC SCAPROC that does a really good job at analyzing and documenting SAS-code. The links below gives you further descriptions of PROC SCAPROC and its options. There’s also a guide on how to do a graphical presentation of the result fra PROC SCAPROC. Program for parsing the output from PROC SCAPROC to create a data set with inputs and outputs. The SAS-macro below will tell you if a variable in a dataset is unique. Description : Gets info about uniqness in a SAS-dataset. &datset : The dataset to test. &variable : The variable to test for uniqueness. &print : If the output/result should be shown in a PROC PRINT. freq_result : Dataset sorted with doublets as first rows. freq_result_doublets : Data containing only the doublets. The code below will give you the path of all the directories containing macros in the SASAUTOS in your SAS-session. If your SAS-session crashes when you connect with RDP to a server the root-cause could be a check that SAS does for available printers. To avoid these crashes it is possible to set a parameter in the config-file for SAS. The main config-file for SAS is called SASv9.cfg and in SAS 9.2 it’s usually located in C:\Program Files\SAS\SASFoundation\9.2\nls\en.